Our range of products include steel galvanized flush doors, galvanized steel doors and galvanized steel window. Design Type As per customer needs. With a very little human involvement, the whole process is carried out while the sheet is moves through a conveyor belt. For that reason, there is no scope for any welding job. Made of G. I. Sheet H. M. P. S. (100 x 50) section in 18 / 20 gauge with 6 nos. hold fast. Made out of .60 mm G. I. Sheets on both side shutter construction by roll forming and snap fitted edges. Thermal barrier between 2 snap joints to avoid metal to metal contact. No welded joints any where in the shutter. PUF insulated core for rigidity and strength. Wooden inserts for fixing hardwares. 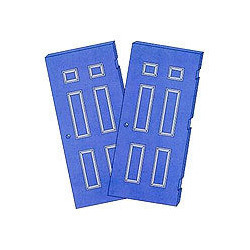 To manufacture our range of galvanized flush doors, we use two packs of epoxy primer which makes it abrasion and chemical resistant, giving it high bonding strength and making it strong and odor-free. These doors are available in a wide spectrum of colors. The paint used to color the door gives full protection against UV rays. Our galvanized flush doors are available in the height of 2and half to 8 meter and width of 2ft to 4 meter. The prices are negotiable upto certain extent. We offer strong and durable Galvanized Steel Doors which are made of galvanized stainless steel. 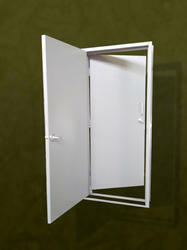 The doors we offer are available in a width of 3 feet - 4 meters and height of 7 meter - 8 meters. They find their applications in various industries because they are designed and manufactured to suit with the rough and tough industrial conditions. We also provide customized galvanized steel doors as per the clients requirement. Looking for Galvanized Steel Doors ?